Medicare Supplement Plan C is one of the ten Medigap plans offered. 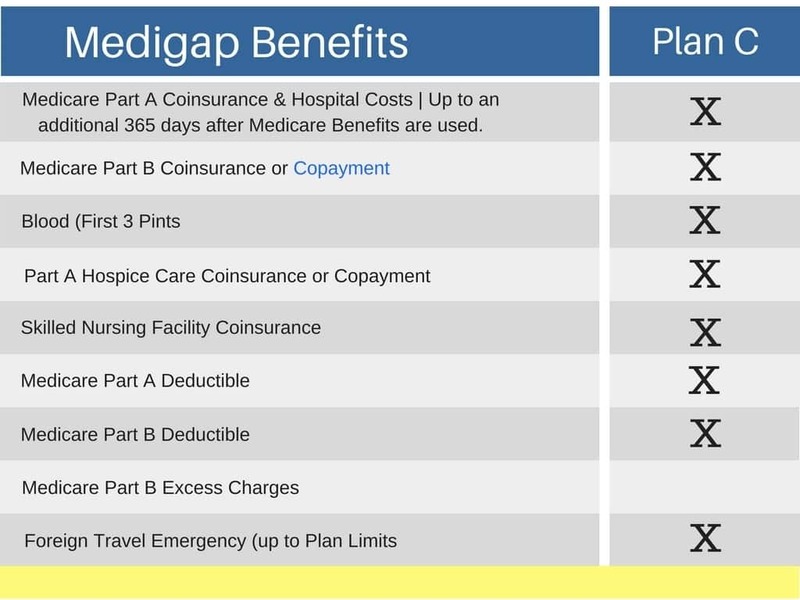 Original Medicare (Parts A and B) is full of gaps. If you are looking for supplemental Medicare insurance that will eliminate almost all of these unexpected expenses, Medigap Plan C may be the plan for you. You can compare rates here on this page or by calling us 844-528-8688. Continue reading to see if Medicare Supplement Plan C fits you. With out Medicare Supplemental insurance, you will still have to pay a number of out-of-pocket costs for charges like deductibles, copay's, and coinsurance. Medicare is an excellent source of peace of mind for senior citizens who might otherwise be unable to find affordable health care. However, even though it provides coverage to those who might otherwise be left uncovered there are still costs that could be covered by one of the ten Medicare Supplement Plans. Is Medicare Supplement Plan C the right plan for you? Keep reading to find out. While most Medigap plans cover the most common deductibles, copays, and coinsurance charges, Medicare Supplement Plan C goes beyond this coverage to extend into less common charges. Beyond Plan F, Medicare Supplement Plan C is the most comprehensive option available. The only benefit not included that you can receive from other supplemental insurance is coverage for Medicare Part B Excess Charges. Many people confuse the Medigap Plans with the Parts of Medicare because there is overlap between the letter names. Medicare Part C is another name for a Medicare Advantage Plan. If you choose this option you are having a private insurance company deliver your Medicare benefits, and you CANNOT enroll in Medigap. Medigap Plan C is one of ten supplemental insurance plans that you may choose to purchase in addition to your regular Medicare benefits in order to add extra coverage. Who Is Medicare Supplement Plan C Best For? Because it covers almost everything, Medigap Plan C is ideal for those people who want the maximum amount of peace of mind, so long as they don’t mind the chance of paying extra if their doctors happen to charge above Medicare’s suggested prices. You can always ask your care providers ahead of time if they “accept assignment” in order to make sure that they don’t charge extra. Ready to Enroll in Medicare Supplement Plan C? Plan C does have one of the highest premiums of all the Medicare supplements, and not every company offers a Medicare Supplement Plan C, so you may want to consult with a professional about your needs in order to decide if it’s really the plan for you. Don’t go it alone. Call us at 844-528-8688 or get in touch through our contact form to get the help you need today. There is never a fee for our services.